(MENAFN - The Conversation) As Australians prepare for their upcoming election in May, Indonesians will head to the ballot box Wednesday, 17 April 2019. Over 190 million people are registered to vote in Southeast Asia's largest democracy. While citizens of both countries will choose their representatives in their respective elections, they have different ways of carrying out elections. Firstly, unlike in Australia where voting is compulsory for citizens, Indonesians can choose to exercise their right to vote or to decide not to vote. 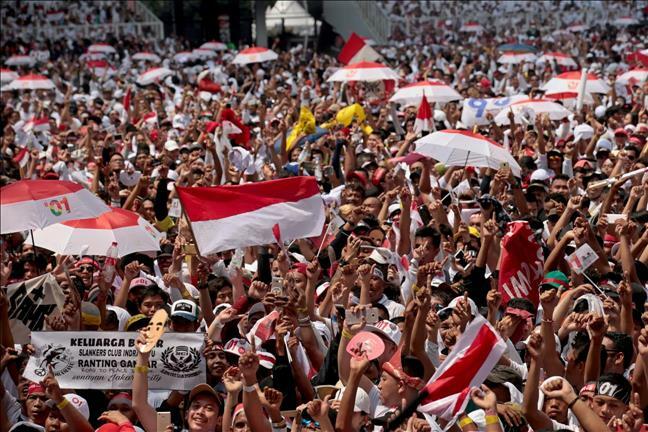 Analysts predict that the number of non-voters, called the 'golongan putih' or the white group, in Indonesia will increase this year. While some voters might not turn up to the ballot box due to political apathy, some non-voters argue that it's a valid political stance in the face of a lack of good choices. These people may turn up at the ballot box but punch all the ballot papers, to ensure their non-vote is counted. Meanwhile current Australian parliament is in de facto described as two-party system, Australian voters cannot directly select their prime minister. Instead, they select their members of parliament from two major parties, some minor parties, or independent members. In most cases, members belong to and support a political party. The major political party that can win more than 75 members will be able to form the government, and thus its leader will be designated as the prime minister. Meanwhile, Indonesia exercises direct presidential election under a multiparty system. Even though Indonesian voters can elect their president, the nomination of presidential candidates is determined by political parties obtaining 20% seats in the DPR. In Wednesday's election, Indonesian voters will choose candidates for president and legislators. This year, there are two presidential candidates and 14 political parties in the race. Incumbent Joko 'Jokowi' Widodo will once again face off against former military general Prabowo Subianto. Jokowi, the candidate from the Indonesia Democratic of Struggle (PDI-P), is supported by a coalition of nine more parties. Prabowo from the Great Indonesia Movement Party (Gerindra) has three more parties in his coalition. Indonesia introduced the direct presidential election in 2004. It has carried out general elections since 1955, but went through a series of authoritarian leaders, first under Sukarno and then Suharto. Following the latter's fall in 1998, Indonesia underwent democratisation. The presidential candidates have to secure over 50% of the popular vote to win the election. If no candidates were able to gain 50% in the election, a second round of voting would be held to seek the majority votes. The elected president is both the head of state and head of government. As the executive government is not derived from legislative chambers, the Indonesian president is not a member of parliament. The president exercises its power to form a cabinet. Ministers focus on running an executive portfolio and are not part of legislative functions. Australia's House of Representative preferential system allows nearly 17 million voters to rank their ballot based on their preference. The Indonesian presidential general election exercises simple majority system, through which the citizen votes only for one option. Indonesians use a nail to punch the ballot papers. Australia exercises single-winner voting, meaning one district is only represented by one member from one political party or an independent. In Indonesia, one constituency can be represented by more than one member from more than one political party. While the upcoming Australian House of Representatives will consist of 151 members and each will represent single-member districts, the DPR will consist of 575 seats from 80 constituencies. In other words, each Indonesian constituency is represented by more than one member, depending on the size of the population. As in every country, there are particular issues that voters feel emotional about, and this is where politicians use their tactics to garner votes. In Australia, voting behaviour is shaped by a number of issues such as management of the economy, unemployment, industrial relations, taxation, education, health, environment, global warming, refugees and asylum seekers. Issues over management of the economy and health were the most important issues in the 2016 election. Another issue is also about Australia's political instability. Before 2010, Australians tended to believe they essentially select their prime minister. However, after six leadership spills since 2010, Australian voting behaviour shifted to perceive the removal of prime minister before election as more acceptable . In Indonesia, voting behaviour in Indonesia is somewhat influenced by three factors : religion, ethnicity and regionalism, and social class. Being the most populous Muslim majority in the world, Indonesia is seeing both camps building alliances with Islamic groups and promoting Islamic symbols and rituals as part of their tactic. Last week, a group of well-known Islamic preachers declared their support to Prabowo Subianto. Ustad Abdul Somad, for example, one of the most famous Indonesian Islamic preachers with 8.8 million followers on Instagram and 1.2 million subscribers on Youtube, expressed his support through a 13 minute interview with Prabowo, relayed on national television. On Jokowi's side, other Islamic preachers such as Maimun Zubair and Luthfi bin Yahya presented a turban and prayer beads to Jokowi as a gesture of support. Nahdlatul Ulama (NU), the biggest Islamic organisation, has openly declared its support of Jokowi, as his vice president candidate, Ma'ruf Amin, is also one of the prominent Islamic preachers from NU. Identity politics as the final trump card in Indonesia is inevitable. Currently, polls show Jokowi is in the lead . We'll see how it goes soon.